It took a last-second buzzer beater for TCU to hold off Oklahoma State. 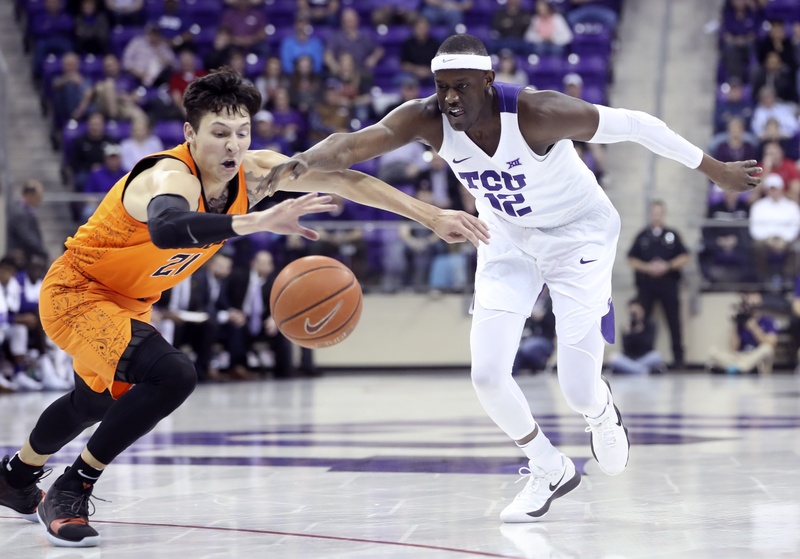 Despite battling back from a double-digit deficit, Oklahoma State fell just short on the road Wednesday night in a gut-wrenching 70-68 defeat at TCU. And it came down to two buzzer-beating shots. OSU looked spread thin and out-manned from the tip as the home team poured in 3-pointer after 3-pointer to start the game. The Horned Frogs came out firing, launching seven of their first 10 shots from beyond the arc and shooting 9-of-18 from 3 in the first half. Desmond Bane was 5-of-6 from deep in the opening period and Kouat Noi was 3-for-6. Isaac Likekele was the Cowboys’ offense pushing the ball in transition and getting to the rim almost at will. He scored 8 first-half points on six shots. After falling behind as many as 13 early in the second, OSU used a 13-2 run, led by Likekele, to cut the lead to 2 midway through the final frame. That set up the go-ahead 3 by Thomas Dziagwa that gave the Cowboys their first lead with 8:17 remaining, and caused Jamie Dixon to call his penultimate timeout a few seconds later. The Cowboys, who had looked like they were just along for the ride for much of the first 30 minutes of game time, all of the sudden were taking it to the Frogs and even built a 7-point. It was a slugfest from then on out, ending with a heart-breaking buzzer shot by TCU. Thomas Dziagwa made his fourth 3-pointer to tie the game with 5.6 seconds remaining. Then TCU pushed the ball down the court and J.D. Miller went right and dropped one in at the buzzer to give his team the win. Or did he? Both teams had left the floor, and the home team was celebrated and singing its alma mater when officials called everyone back. OSU was given 0.3 ticks of life with the length of the floor to go. It was just enough time for the tip-in that would not be — torturous. Time expired again and the Cowboys had to live through a gut-wrenching loss for the second time on Wednesday night. Mike Boynton’s pair of freshman starters outshined all of his veterans in Ft. Worth. Likele, who hails from nearby Arlington showed out for his friends and family that showed up in support, and he showed just how effective he can be when he is aggressive and gets to the rim. OSU’s rookie point guard reached double digits for the first time since his career day in Morgantown (six games ago) pouring in 17 points on 7-of-13 shooting, and added three rebounds and seven assists to three turnovers in a team-leading 39 minutes. For Anei, it was business as usual — at least as of late. The freshman big man has averaged 10.7 points, 3.2 rebounds and 2.2 blocks over the last six games. He finished with a career-high 20 points on 7-of-7 shooting leading all Cowboys. He also added five rebounds and two blocks. The 55.3-percent free-throw shooter coming in, went 6-of-7 from the charity stripe. After giving up 9-of-18 from deep in the first half, the Cowboys held the Frogs to 2-of-12 from 3 in the second. That plus the aggressive play of Likele and stellar game from Anei were almost enough to steal the upset road win. Next up: The Cowboys head to Lawrence on Saturday to face the Jayhawks inside Allen Fieldhouse at 11 a.m.